Even as students are growing more disappointed with the state of technology in their classrooms, digital textbooks are proving to be an outlier as a trusted learning tool, according to a recent survey of 500 college students conducted by Wakefield Research for VitalSource. Even as nearly one-in-five are not happy with the technology in their classrooms and almost three-quarters of students do not believe an increase in available classroom technology would improve their grades, they overwhelmingly believe they would have more success with interactive textbooks. The What: ADDERLink XDIP is a high resolution, ultra-low latency, IP based KVM extender or matrix. 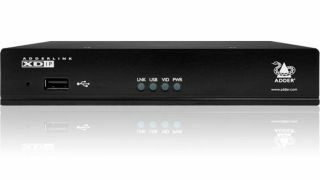 Enjoy full HD AV over your IP network with easy operation across a standard 1GbE local network giving you the choice of a point to point extender or matrix solution. Using a standard IP network transmit up to 1920 x 1200 video stream, audio and USB over a single CATx cable. The What Else: Each node also has a feed through port allowing the ability to switch between a remote and local computer. The What: HELO is AJA’s new H.264 streaming and recording stand-alone appliance. It offers a range of professional AV workflow options with both 3G-SDI and HDMI inputs and outputs, the power to handle up to 1080p recording formats and a simple web-based UI for easy configuration. The What Else: HELO allows users to simultaneously stream video signals directly to Web Content Delivery Networks (CDNs) while recording either to an SD card, USB drives or network-based storage, with dedicated record and stream buttons for easy operation. HELO will be available soon through AJA’s worldwide reseller network for a US MSRP of $1,295.00.